I adopted a new puppy, but my cat doesn’t like him at all! She hides under the bed and hisses when she sees the puppy. When will they be friends? Letting them “work it out” is not the best approach when introducing a new pet to your cat. Cats need time to develop relationships — cats newly introduced in shelter quarantine environments can take 5 weeks before they start to show “friendly” behavior towards each other, and it can take as much as a year in long term social housing. Also, cats take longer to recover from a negative interaction, and can stay aroused for hours after exposure to aggression from another cat or dog. So don’t rush it! New pets should be introduced slowly and gradually — micromanage them! In the beginning, the pets should be kept completely separated, with no ability to see or touch one another — the earliest exposure should be scents and sounds only. Rub the new pet with a towel, and bring that towel to your cat to sniff; then do the same for the new pet. You can also rub the pets with stuffed animals and use the toys as a stand-in, as dogs and cats may initially react to stuffed animals as if they are real. The next step is to feed both pets on either side of a closed door — it helps them to associate pleasant experiences with one another. Once both pets can handles scents and sounds calmly, arrange a brief visual introduction, using crates, leashes, or baby gates to prevent physical contact. If either pet seems anxious or too excited, increase the distance between them or end the session. Over time, gradually increase their time together, and decrease the distance between them. Once you’re ready to allow more interaction, allow the cat to approach the dog at her own pace, and protect her safety. Cats should have some high perches for escape, and be sure there is safe access to food and litter boxes. Do not leave them together unsupervised until they have been getting along for quite some time. Finally, be sure to have realistic expectations. 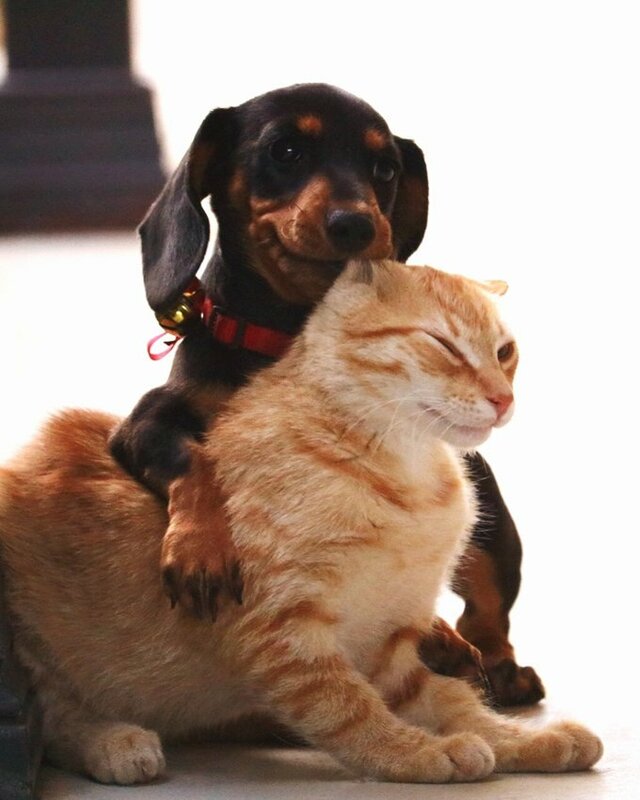 Not all cats and dogs will form strong social bonds — you may have to be satisfied with mutual tolerance.